Enjoy a spring-fresh, organized home every day! promoting the safety and development of young children and others in their care. Training is offered to Domestic workers in three main courses. Domestic Child Care, Spring Cleaning and Domestic Cooking. Domestic workers can be enrolled by their employers or they can enroll themselves. Employees will learn the skills required to care for infants and young children, the elderly or infirm. They will also learn how to prepare nutritious meals and the daily cleaning of the home. The workers may be employed in private households, hotels, lodges, guest houses, gyms etc. 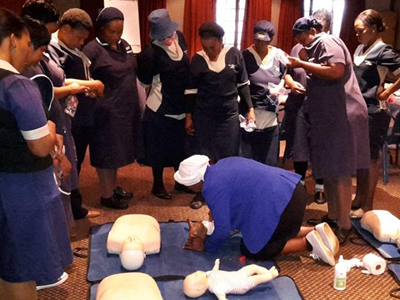 Parents and other caregivers who wish to learn First Aid and CPR can do this through one of our Basic First Aid Courses. Accredited training is offered to businesses for Level 1 and Level 2 First Aid Courses. These courses are accredited through the Dept of Labour and HWSETA. These courses are also suitable for Gym instructors, swimming instructors, schools, crèches and hospitality establishments. “I am so impressed already with the turnaround happening in our home. “The ladies on the course felt bad taking a salary for the job we were doing! I am looking forward to showing you what I have learnt.